Manufactured in Korea and or China this cable is made by Powder coating aircraft cable. Manufactured in Calgary this cable is made by coating offshore aircraft cable with a tough and durable PVC coating. The colour is flat black to best fade into the background. *IMPORTANT: Coating must be stripped before terminations are applied. Manufactured offshore from a high strength specially processed wire it used where high strength in small size is required. The ability to fly in a chandelier or similar object on a single line with no bridles is possible with rotation resistant ropes. Special handling considerations are required when using rotation resistant rope. Rotation resistant cable is more temperamental than ordinary cable types. Do NOT use aluminum compression sleeves on stainless cable, copper only. Ends must be seized before cutting. A minimum design factor of 5:1 is recommended 10:1 is preferred where possible. All of the oval sleeves that we supply (copper or aluminum) are capable of supporting a greater load than the rated breaking strength of the cable to which they are attached when properly applied. Only one sleeve is needed to achieve this rating when making an eye though sometimes a second sleeve is applied to hide the “bitter ends “of the wire sticking out. Two sleeves are required to make a lap splice. Stop sleeves are only capable of holding 1/3 to 1/2 of the rated breaking strength of the cable to which they are attached. Regular checks of your tool with a "go-no-go" gauge are imperative to ensure proper compression. On stainless steel cables copper or stainless sleeves are required. AVAILABLE FOR CABLE FROM 1/32" - 5/16"
USITT guidelines and Draft ESTA standards recommend Only copper for overhead lifting and permanent rigging. How to apply these fittings? Visit the Loos & company Web site for excellent detailed instructions. Thimbles should be used whenever a rope or wire rope is formed into a tight eye. 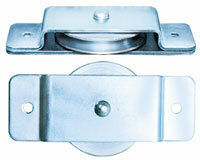 We offer three styles, AN cold rolled zinc plated steel, Standard thimbles and Heavy duty. Stainless steel and rope thimbles are also available. On smaller sized cables, we find using an oversized thimble often makes the attachment of fittings easier. Below is a 1/8” standard, a 3/16 AN Zn, and a 1/8” AN Zn Thimble. Cold Rolled Steel Zinc Plated Part No. AN thimbles come in either cold-rolled steel (zinc plated) or stainless steel (natural finish). Fit cable diameters from 1/16” to 3/8” to meet the most demanding marine, aircraft or industrial requirements. AN Thimbles meet all Military Specifications. Often generically referred to as Crosby clips and occasionally as bulldogs we offer both forged and malleable wire rope clips. 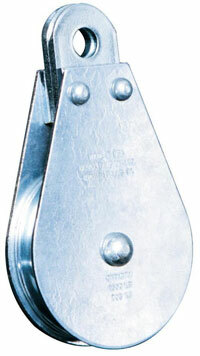 Forged clips are required for use in overhead lifting. The malleable clips are recommended for non critical light duty applications such as guard rails, guy wires etc. 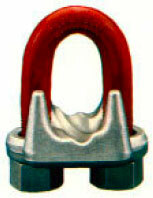 The efficiency rating on the proper number of properly applied wire rope clips is 80% of the strength of the wire rope. 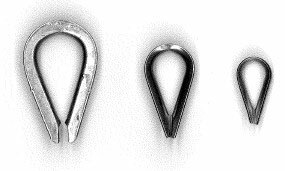 We offer both offshore and Genuine Crosbie Wire Rope Clips. Fist Grips have a couple of advantages over Wire Rope clips in that they are impossible to apply incorrectly and they damage the rope less in situations where the clip will be removed. Wire rope clips must be re tightened after applying load. In accordance with good rigging practice wire rope and its terminations should be regularly inspected. Whatever the nomenclature we can supply the cables you need. 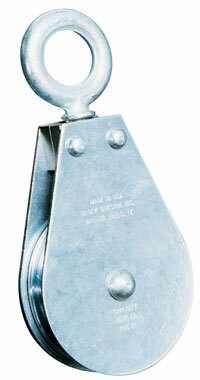 For hanging chain hoists and the like, we have 5's, 10's, 20's in 3/8 or ½” steel. These are manufactured with a Flemish eye splice and then secured with a pressed tapered steel sleeve. Each end has a heavy-duty thimble. We can also fabricate the cables you require for the suspension of scenery with cable from 1/32” to 1/4" with the fittings of your choice..
Slings are made with Heavy Duty Thimbles and Flemished Spliced Eyes on each end. 3/8” Thimble Eyes will accept a 5/8" Shackle, 1/2" Thimbles will accept a 3/4" Shackle. Different Brand or trademark names for similar but very different products. When looking at a lifting sling from an aluminum tube’s point of view, it prefers supple, soft and nonabrasive slings. A round sling is the prefect choice rather than a steel sling. Round slings are made of many strands of polyester covered with a protective polyester sheath. Unfortunately, polyester melts at approx. 250°C (~480°F). Research has shown that a 2k luminair-housing can reach temperatures of about 190°C (~370°F), with the truss-chord straight over it being almost 140°C (~280°F). Accidents have been reported of round slings being melted by spots, pyro or the heat of the rays, and as a result, trusses have fallen. When round slings are used, a safety backup must be applied such as a wire rope or chain sling. 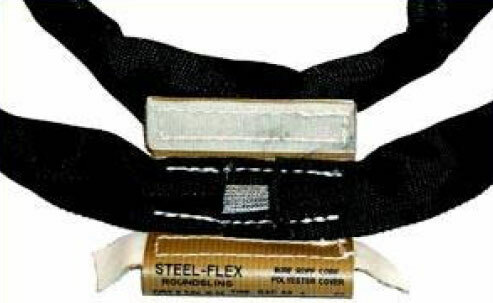 So rather than have a backup steel sling why not make the sling out of steel but softer than a single cable. A steel round sling has a normal outside webbing for soft slings, but instead of the polyamide core, the steel round sling has a core made of many small steel cables, which makes it resistant to high temperatures. The steel wires within the steel round are as flexible as a normal soft sling, but have a much better fire resistance. The steel round can be used in circumstances where the normal soft slings are not allowed. The outside webbing is black, including an identification label and a hidden inspection window to inspect the steel wires within the sling. The wire-rope core has better heat resistance than the truss itself. Black Steel Round sling with Galvanized Aircraft Cable on the inside. unique inspection window allows for easy inspection of steel cable. Rated Capacity: Vertical :5300 lbs. Choker :4200 lbs. Basket :10200 lbs. Safety cables for lights are available. 30” Long made with 1/8” black power coated aircraft cables fitted with a 5/16 ferruled steel snap. Down Stage Right can supply most of your rope and cordage requirements from twill tape and black cotton tie line to large diameter manila and polyester ropes and braids. To make life very very confusing the synthetic fibre ropes are all available in either a 3 strand, solid braid, double braid or parallel core configuration in nylon, polyester or more exotic materials. Polyester ropes are available in a spun or non spun finish. Due to the huge number of different sizes, colours, materials and braid types combinations (and to simplify things) Down Stage Right Industries stocks several favourites that we have found the theatrical industry usually purchases. If you need a particular rope we are happy to bring in the particular configuration and colour that you want. Please call for details or recommendations for a particular product. Twill tape is a flat twill-woven ribbon of cotton, linen, polyester, or wool. Used in attaching soft goods and electrical cables to pipes we offer both cotton and polyester twill in 100 yard rolls. 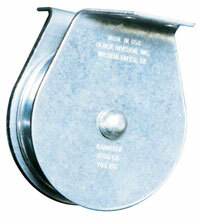 Used as a general purpose tie line for drops or cables it is offered in 1000 and 3000' spools. Available in cotton and polyester. Size 4, #4.5 or 1/8” and #5. The primary advantage of sash cords are their handling characteristics and their knot holding ability. It does not have the strength or durability of double braids. Available in white as a cotton polyester blend or in black as spun polyester. Sash braid is generally a coarser cousin of solid braid. A bees waxed polyester fibre used for whipping the ends of ropes. Available in a 40lb and 100lb test. Working loads are guidelines only. Once put into service rope is continually deteriorating. Manila rope will deteriorate in storage even under ideal conditions. Solid braid ropes are sometimes referred to as “sash cord” because this pattern was used to raise sash windows. It is formed by braiding 8 to 18 strands in a reasonably complicated pattern with all the strands rotating in the same direction on the braider. The individual stitches are oriented in the same direction as the rope. The center may contain a filler core. These ropes maintain their round shape well and therefore work exceptionally well in pulleys and sheaves. They tend to have high elongation and are generally less strong than other forms of construction, and are difficult to splice. "Double braid" ropes, also referred to as "Marine Ropes" or "Yacht Braid" or “2 in 1” are perhaps the most well known braided rope on the market today. They are constructed of a hollow braided rope, which acts as a core inside another braided rope. 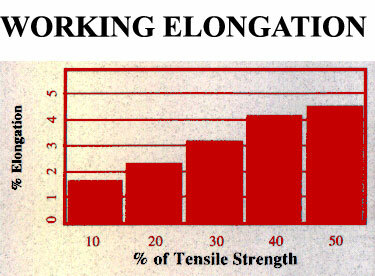 The combination of the 2 ropes in 1 results in a rope with higher tensile strength than commonly found in twisted ropes. The inner rope and outer rope are generally designed to share the load fairly evenly. Double braid ropes have a torque free construction, and are easily spliced. However, caution must be exercised where double braid ropes are run over pulleys, through hardware or in any situation where the outer rope may slide along on the inner rope and bunch up. This condition, often called "milking", will cause dramatic loss of strength by causing the entire load to go onto the inner rope, because the sheath is bunched up and therefore not under the same tension as the inner rope. Polyester double braid ropes big advantage is that they do not have the same stretch as nylon. They can also be made with a soft “spun” covering giving a better hand feel. 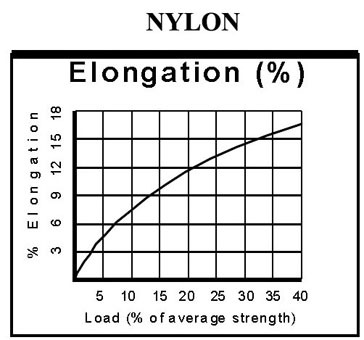 The elasticity of nylon ropes can absorb sudden shock loads that would break other ropes. Manufactured by New England Ropes Stage Set X is a superior replacement for manila with a longer life, much higher strength and no slivers. This rope was specially developed as a replacement for manila hand lines in counterweight rigging and we find it to be Cadillac of the synthetic hand line ropes. Multiline II is a three stranded rope with the same ideals in mind. It is more economically priced and has slightly different handling characteristics. PRODUCT DESCRIPTION: New England Ropes' Stage-Set X is the softest, strongest and most environmentally stable product available in the theatre industry for counterweight systems. It's parallel core of polyester fibre contained within a helically wrapped polyester tape and covered by a braided polyester jacket, remains firm and round under all load conditions and resists crushing in rope locks. Good resistance to most minerals / organics, acids, weak alkalis, bleaches and other oxidizing agents and most solvents. 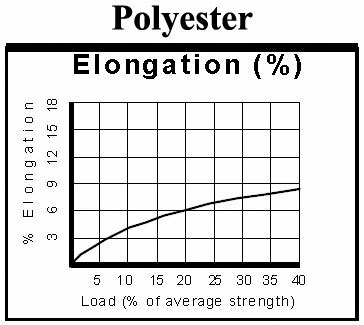 Polyester is generally considered to have a better overall resistance to acids or oxidizing agents. No blanket working load recommendation can be made because it depends on the application and conditions of use, especially potential danger to personnel. It is recommended that the user establish working loads and safety factors based on professional and experienced assessments of risks. The working load is a guideline for the use of a rope in good condition for non-critical applications and should be reduced where life, limb, or valuable property is involved, or exceptional service such as shock, sustained loading, severe vibration, etc. The Cordage Institute specifies that the Safe Working Load of a rope shall be determined by dividing the Minimum Tensile Strength by the Safety Factor. Safety factors range from 5 to 12 for non-critical uses, 15 for life lines. Can be Urethane coated to improve abrasion resistance, UV resistance, to create a water barrier, and to provide color coding. PRODUCT DESCRIPTION: Multiline II is a 3-strand composite rope, its unique construction combines filament and staple/spun polyester wrapped around a polyolefin core (smaller than 1/2" diameter does not have polyolefin core). Multiline II feels and handles like manila, yet provides greater durability, higher strength, lighter weight, and a consistent supple feel over time. Renders well around blocks, sheaves, and winches. Polyester jacket protects against UV degradation. 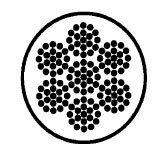 The polyolefin fibers are UV stabilized to minimize UV degradation. Can be used outside over long term if inspected regularly. Good resistance to most minerals / organics, acids, weak alkalis, bleaches and other oxidizing agents and most solvents. Polyester is soluble in 95% sulfuric acid or strong alkaline's at boil. Polyolefin is soluble in concentrated chlorosulphonic and sulfuric acids. These are rated blocks grooved with steel sheaves fitted with Bronze bearings grooved for cable from 1/8” to 3/8” and sheave sizes from 1 ½” to 5” in diameter. Most blocks are available with single or double sheaves. Sheaves without housings are also available if you want to build your own creations.